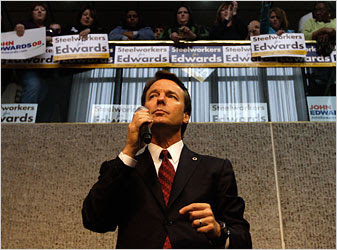 John Edwards' Message. . . 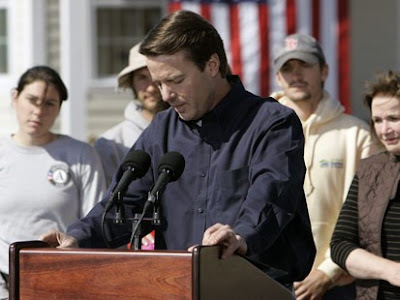 I'm sorry John Edwards dropped out of the race for the Democratic nomination for President. Chronicle all of the criticisms you want. Parade out all of the stories, point out the inconsistencies as you see them, make fun of his haircuts and fire away at the size of his home. Oh, and don't leave out the lawyer jokes! I'll wait while you finish up with all of that. . . .
Edwards always pushed the issues of poverty to the forefront. As in every single speech. And it wasn't a matter of party or partisan commitments. Edwards forced everyone to at least look at the issues surrounding poverty in America. I reget that this important emphasis may be lost to this campaign. I hope and pray that it will not be, but I fear we lost a lot when he withdrew on Wednesday. Many who drop in here accuse me of believing that the government is key to solving all of our social problems and overcoming all of the challenges associated with poverty. Why on earth would I believe that, especially in view of government performance over the past three decades? What readers here confuse with a belief in government's ability to solve big problems, is my tendency to criticize what our government actually does or does not do in the face of many formidable issues. I'll cite a few examples from recent news reports and national developments. Case one: Last week I read a bewildering story about how the state of Mississippi plans to divert $600 million of hurricane housing relief funds to a port expansion project ("Katrina aid to be shifted to port," The Dallas Morning News, 14A, Saturday, January 26, 2008). The harbor at Gulfport sustained approximately $50 million in damages when Katrina swept through. Currently, 30,000 residents still live in FEMA trailers. The state believes that since there is "not enough funds to restore or rebuild all of the 169,000 homes in the state" that are in need of attention, the funds could be best used to undertake the massive port expansion. Hmmm. Homeowners and residents versus big businesses at the ports. Any surprises here as to who wins? Case two: The President and Congress are working on an economic stimulus plan to inject $150 billion into the American marketplace. The initial suggestion involved no economic benefit to the working poor who paid payroll taxes, but no income tax. The revised version that passed the U. S. House of Representatives on Tuesday contains benefits for the working poor. If the Senate concurs, it appears that around June 2008 millions of households will receive rebate checks ranging from $600 to $1,600. The assumption is that these funds will be spent quickly and will provide our slumping economy a boost. Hmmm. Apart from the basic problems associated with an economic system that depends on unbridled spending for sustainability, I am wondering who we might expect to spend this money more quickly? Will it be the family with annual earnings over $200,000? Or, will it be the family whose gross annual income is around $35,000? Where should the injection be targeted to be most effective? Case three: A few years ago, I conducted a research project of sorts to determine 1) how many Dallas County residents who were eligible for Food Stamps were not enrolled in the food and nutrition program and 2) what the failure to enroll these qualified families was costing the retail grocery industry in the county. What I discovered was fairly amazing, at least to me. Bottom line--Dallas County loses over $250 million annually in retail grocery sales because we don't sign up everyone who is eligible for Food Stamps. Talk about an ongoing economic stimulus package with public health, educational performance and family stability benefit added in for good measure. But, then, what do I know? It is true. I do believe our governments could do more, much more. But it is also true that much of what they do is not serving those who need it most. But, now we're talking philosophy. Remembering the actual impact of a person like Dr. Martin Luther King, Jr. is not so easy as it may appear. An entire generation has been born since his tragic death in 1968. The impressions these younger men and women have of the man and his signficance had to be formed by sources other than personal experience or witness. At the same time, those who remember the work and life of Dr. King may have the tendency to "sanitize" or "domesticate" his words and his work to make both more palatable to a general audience--something about being a national historic figure with a national holiday and all. But, I must say, Dr. King wasn't playing around! I'm proud that we have posted on the splash page of our website the last speech he delivered before being assassinated the following afternoon in Memphis, Tennessee where he had come to help City of Memphis sanitation workers who were on strike for better wages and working conditions. To see how far we've moved away from Dr. King's values and vision just consider the general attitude in the United States today toward organized labor. What strikes you most about his last words? Last Friday, The Dallas Morning News published a piece I originally intended to post here in its Op-Ed section. Several years ago lots of people got the idea that the best way to celebrate the Martin Luther King, Jr. national holiday was to organize a special day of community service. You've likely heard it: "Not a day off, but a day on!" The idea being that the best way to honor Dr. King's memory and legacy would be discovered in organized volunteer efforts to extend compassion and aid to the less fortunate among us. Here at Central Dallas Ministries we manage a rather large AmeriCorps program, so we received word from the Corporation for National Service that directed programs like ours all across the nation to orchestrate volunteer projects. Certainly nothing wrong with that. "President Bush marked the Martin Luther King Jr. King holiday by volunteering and calling on Americans to honor King’s legacy by showing compassion on the holiday and throughout the year. Here in Dallas, we enjoyed the commentary of popular Dallas Morning News columnist Steve Blow, who bemoaned the lack of organized community volunteer opportunities on this special day of national service ("Ready to go, nowhere to serve," January 20, 2008). I'm all for seeing folks volunteer. I believe in the value of community service. Nothing beats genuine compassion and concern for others, especially those who are down and out, ill, mistreated, marginalized and neglected. But, in my opinion, the continuing and growing effort to link the memory of Dr. King to a day of volunteering diminishes the real significance of his life, to say nothing of how badly it misses the mark in understanding his personal mission. Dr. King didn't call folks to volunteer to help the poor. He wanted to know why so many people were poor in a nation of such opulence and wealth. So far as I know, Dr. King never organized a food pantry or invited the rich to serve in soup kitchens. He asked hard questions about the meaning of hunger and homelessness to our collective, national soul. He didn't call for mentors and volunteer projects in our public schools. No, Dr. King asked penetrating questions about the quality of education for all of our children. Dr. King didn't just invite people to visit the hospitals where soldiers were returning home with severe injuries and lifelong disabilities caused by a terrible conflict in Southeast Asia. He asked why the war needed to continue at all. He didn't wonder why more health care professionals weren't volunteering in indigent clinics. He challenged the nation to adopt a just universal health care policies to insure that every American received adequate and routine treatment. The kinds of volunteer opportunities that Dr. King invited people to take part in often landed them in jail, not on the front page of the society section! He asked people to march, to register to vote, to sit in, to resist and to confront systemic injustice and unfair laws. He asked people to lay down their very lives for the sorts of changes that made the American system better for everyone. His program didn't seek to simply meet needs. His vision called for the elimination of need. Certainly, I see and often champion the value of community service. However, to redefine Dr. King's life and legacy in those terms limits his importance and drains his message of its power. And, frankly, such an emphasis lets us all off the hook when it comes to the fundamental and sweeping public policy changes still needing our attention and the full expression of our courage as a people. Jim Wallis, editor of Sojourners magazine and author of a number of important books dealing with faith, society, poverty and social justice, appeared on The Daily Show earlier this week. His interview with Jon Stewart reveals that the man really "gets it" when it comes to faith and life in 2008. Wallis is just out with a new book, The Great Awakening: Reviving Faith & Politics in a Post-Religious Right America. Likely a book that would be worth our time. Looking for a bit of inspiration drawn from the real world of a tough inner-city neighborhood? I predict reading about the work being done in arguably the toughest neighborhood in Dallas will lift your heart. After you've seen it, tell me if I'm right or not. Our recently commissioned study of the "business case to end homelessness" in Dallas contains an important and insightful section comparing emergency shelters and permanent supportive housing. Seems worth repeating here. Different types of homeless people have different types of needs. Most people who become homeless are only without a home for a short period of time due to unforeseen events or financial circumstances. For these individuals, shelters and emergency supports are appropriate to help them get back on their feet quickly. Most citizens never notice these temporarily homeless individuals and families. The homeless you see on the street corners are likely to be chronically homeless individuals. Supportive housing provides a permanent solution to this most visible and costly element of the homeless population. Shelters that operate on an emergency basis are inappropriate for these individuals because their homelessness, and the problems that caused their homelessness, are chronic and long-term, not a temporary emergency.  Treat homelessness as a temporary problem that can be solved with temporary assistance.  Are necessary and appropriate for individuals experiencing temporary homelessness in need of emergency assistance.  Cannot effectively serve the emergency needs of temporarily homeless individuals and families if their capacity is being strained by chronically homeless individuals who have little hope of ever "landing back on their feet" without significant assistance.  Are designed to serve a continual flow of different individuals, not the same individuals day after day, year after year.  Rarely provide 24-hour operation, privacy, or secure space to store personal belongings—hallmarks of freedom that chronically homeless individuals need and want.  Often impose strict rules on guests and alcohol; while understandable from a group safety perspective, these rules are more likely to alienate chronically homeless people with substance abuse problems than produce instant sobriety.  Recognize that some homeless individuals will never return to mainstream society without permanent supportive services.  Aid residents in securing unclaimed benefits for which they are eligible, such as social security, thereby offsetting the costs of the project.  Provide flexible supportive services that maximize each resident’s ability to live independently without mandating participation in specific classes or treatments.  Integrate caseworkers and programming to assist residents in dealing with and overcoming addiction, mental illness, chronic health problems, and physical disabilities; developing money management and other life skills; and securing and retaining gainful employment. Residents with jobs are asked to contribute a portion of their income as rent, just like other subsidized housing programs.  Provide a long-term solution centered on individuals, not a pipeline. Supportive housing does not impose caps on the length of stay nor try to push residents towards moving out.  Empower homeless individuals to make lasting changes in their lives by providing the ultimate symbol of dignity: a key to their own place. Building rules and policies are flexible and incorporate tenant input, further respecting that dignity. Without a doubt, emergency shelter beds are essential in any comprehensive strategy to address the problems associated with homelessness in a community like Dallas. At the same, no lasting or substantive solution will be found without the development of permanent supportive housing. What has been your experience in working with homeless persons when it comes to housing and shelter? I'd be eager to know both your experience and your reaction. Brian McLaren will be in Dallas on February 22-23. I'm making my way through his latest book, Everything Must Change: Jesus, Global Crises, and a Revolution of Hope (Thomas Nelson, 2007). There is no way to deal with McLaren and remain unchallenged. Here's an example of his honest analysis of Christian missionary action in the African colonial period. What he describes here occurred in Asia and South America, and, of course, in North American even earlier. Looking to see a movie with a message? Needing to laugh long and hard? Searching for meaning in the face of death's reality? Wondering about the importance of friendship and community with others? Go see The Bucket List, starring Jack Nicholson and Morgan Freeman. Several months ago, Central Dallas Ministries and the Central Dallas Community Development Corporation engaged the J. McDonald Williams Institute to conduct a different sort of study on homelessness in Dallas. Our intent was to "prove up" the business case for ending homelessness in our city. In other words, what would be the positive economic impact on our community if we could eliminate homelessness? The study is titled, "The Business Case for Ending Homelessness: Moving From a Scattered and Costly Scheme of Emergency and Revolving Door Care to a Coordinated, Managed, Permanent Solution to the Local Costs of Homelessness" (statisticians go for long titles!). Recent "point in time" census counts of the homeless population indicates that there are somewhere between 5,000 and 6,000 homeless individuals on the streets of Dallas at any one time. About 1,000 are chronically homeless. The chronically homeless use 50% of the shelter capacity of our community. Almost half (43%) of those surveyed in 2006 reported that they were homeless due to the lose of a job. In that same count, 12% reported that they had been homeless on four or more occasions in the past three years. Here in Dallas more than 45 agencies offer housing, food, medical care and counseling/employment services to the homeless population. The chronically homeless tax, not only the limited resources of emergency shelter providers, they also put a strain on hospital emergency rooms, police, ambulance and other public services. Excessive numbers of homeless persons in a given area--on the streets without permanent housing--can depress property valuations and tax revenues. A study conducted in 2000 estimated that the City of Dallas and other local jurisdictions were losing $4.1 million per year due to low property valuations in the southern section of Dallas' Downtown area. What would be the actual costs associated with effectively ending homelessness in Dallas? The development of 1,200 units of supportive housing would effectively end homelessness as we know it in Dallas. The cost of providing 1,000 single resident occupancy (SRO) units would be approximately $25 million or $25,000 per unit. In addition, 200 family units could be developed for a cost of $7 million or $35,000 per unit. Additional operating funds for developing these properties would be about $3 million or $2,500 per unit. Total development costs for the needed endeavor would come in at around $35 million or $29,166 per unit. Spread over a 30-year period the annual costs would total $1.6 million or $972 per unit. Operating costs to provide the supportive services for such a development strategy would total $4.2 million annually or $5,189 per unit. In short, for less than the cost of one year's service expenditures for our current system of managing and serving the homeless population in Dallas, we could develop all of the housing needed to take every chronically homeless person off the streets and provide exactly the supportive services they would need to maintain themselves in the new housing! In addition, we would be able to sustain the plan for 1/10 the cost we are now spending each year. These savings could insure the development of more fit and affordable housing. Several years ago an old lady who has lived inner city South Dallas for most of her long life told me something I'll likely never forget. Somehow the subject of grief came up. If I remember correctly, someone in the community whom we both knew had passed away. As we spoke about loss and the pain that attends it, this woman said, "Oh, brother Larry, we carry our grief in buckets around here. Everybody has lost so much along the way." As I probed a bit deeper as to what she meant, she went on to remind me that loss loomed large and everywhere in her part of the city. Lost: Jobs, mates, parents, children, siblings, health, homes, stores, schools, security, services, justice, hope. . . . Her list trailed off, but seemed endless. Some losses were all about death, violence, and crime. Others related to the giant holes existing in the community's ability to simply live securely and to care for itself. As she told me about the grief of her community and how much everyone carried, we fell silent for a long while. Then, she said, "We just have to carry so much, so much." All I could think to say was, "I'm so sorry." All I could think to do was to give her a hug. Sorrow is a burden, especially when there's so much of it. I received the following email message not long ago. I reproduce it here without editing. This man had read of Monica on this site. His story, his witness relates to the complicated and unfair reality facing millions who have called this country "home" for decades. If we ever reach the point where we completely dismiss the human element in our decision making as a people, we will step across a line onto the wrong side of the ledger of justice. As I read this man's words, I fear we are perilously close to taking just such a step in the wrong direction. God forbid that we do so. In December 11th my girlfriend was arrested at her house as a result of a final order of deportation that she had from October 24, 1986 when she was 5 years old. Back in 1986 she and her mom were arrested after crossing the border however, they were released and scheduled to appear in a court in Harlingen Texas, but they never showed up to the hearing because they moved to New York. That was back in October 1986, the court gave them a period of 4 months to leave voluntarily but of course they did not leave. Her father, who was here before them, became a permanent resident and in 1993 tried to adjust her status but the process got to a point where it stopped. From that time she got an I130 approved and an I212 granted too. Years passed and she never left or retry to adjust her status until 2003-04 when she hired an attorney. He filled a motion to reopen the case that was denied, in fact he did it three times and they were all denied. The person in charge of the case is the district counsel in Harlingen Mike Ochoa. The last time she tried to do something was around 2005-06 as she was trying to use her father who became a US CITIZEN in 1996 to adjust her status. The case was never reopened. In December 11th a couple of ICE officers got to her house around 6:30 am and arrested her. She was taken to a detention center in Pompano Beach Fl and a week later was transferred to the South Texas Detention Complex in Pearsall Texas. At this point we had been talking to a countless number of immigration attorneys and they all said that that is a difficult and almost impossible case. Moreover, some of them charge great amounts of money that neither I nor her family can afford. She is suffering in that so-called detention center the people that work there are not even ICE official it is a private company GEO who is in charge of the detainees they made them sweep and mop the floors sometimes and give these people who are civil detainees who have not committed any crime a really hard time. In a country that advocates human rights they are violated everyday. All the people who love her want her OUT OF THAT PLACE as soon as possible. Her father is a naturalized citizen, her brother is an American citizen and he is about to graduate as a marine. He is going to serve the country that allows her sister to get hurt and mistreated Her youngest sister is also an American citizen and her oldest sister a permanent resident. In other words, she is the only one left out. she graduated from high school in 1999; she got a real state license. Since 1999 she has been paying her taxes annually, she has stocks. She even went to college for a semester, with a hold of course, and had a 4.0 G.P.A. I have official transcripts. I have excellent letters of recommendation from her employers. She has built a good credit; she has a mortgage under her name and paid another in the past. She speaks perfectly English and Spanish and some French. And of course she has a clean criminal record. She has tried to success. lawyers have said that the best thing to do is to wait for her to get deported that at this point it the only thing they suggest because the court in Texas are really difficult and with this case being that long (since 1986) it was going to be even harder. The reason she is detained is that she has a FINAL DEPORTATION ORDER from 1986, I know most laws are really hard to immigrants especially to those with deportation orders but what I think it is unfair is that she is being punished with a "crime" that she committed when she was 5 years old and was not in control of her life. She is a victim of the circumstances. Why if her whole family is American she has to go to Colombia where she has never been since she came here. I also know that this might not be an argument in front o a judge I guess they go by laws and not for reason and feelings. My biggest desire is to see her out that JAIL. She is such a good person and do not deserve to be there a second. She is more American than anyone that has been born in States but the only thing is there is not paper that says that. I READ YOUR STORY ABOUT MONICA AND I CAUGHT MY ATTENTION THAT THAT IS MY GIRLFRIEND'S NAME I WOULD LIKE TO KNOW WHAT HAS HAPPENED TO MONICA AND IF THERE IS ANYTHING YOU CAN HELP ME WITH? What a church could do. . . I sense growing frustration among increasing numbers of church members these days. Seems as if they are believing that their churches ought to make more of a difference in the community than they do at present. When I was a local pastor, I often asked my congregation if anyone would miss us if we disappeared? Good question to ask of any group or life for that matter. I believe strongly that churches could have a huge impact on the life of a community like Dallas. Over the next several days and weeks, I'll throw out a few ideas that may sound a bit unorthodox, but have great potential, at least as I see it. For example, what if your church "hired" one of our attorneys as an urban missionary? A church who "hired" or who provided funding for one of our lawyers, would transform that attorney into a highly skilled urban missionary who on a daily basis is representing the voiceless in Dallas courtrooms. At the same time, the church would have an open door from our public interest law practice directly into the lives of countless men, women and children who need the loving care and compassion that great churches are famous for providing. If you are looking for your church to find real, concrete significance, I think we should talk. --9,386 families (1.71%) in our city are classified as "extremely low income"--meaning they earn below 30% of the Median Family Income (MFI) of the area or less than $19,500. --72,406 families (13.19%) in Dallas are classified as "very low income"--meaning their earn between 30 and 50% MFI or between $19,500 and $32,500. --164,946 families (30.05%) in the city are classified as "low income"--meaning they earn between 50 and 80% MFI or between $32,500 and $52,000. Of course, income levels tell only a small part of the story of this community. When considering quality of life issues, another key consideration involves the concentration of poverty in dense pockets across the inner city. There is no doubt that people would enjoy higher quality lives for themselves and their children if we learned how to create mixed income communities all across the city. Housing stock in this city has become a huge challenge. By definition, "affordable housing" is housing that costs no more than 30% of a family's income. Far too many Dallasites pay much more than 30% of their income on housing each month. Far too many families are forced to live in sub-standard because such housing is all they can afford. The Dallas Housing Authority reports thousands of people on their waiting lists for both Housing Choice Vouchers and public housing units. The waiting time on these lists averages two years. Income levels drive housing realities. Too often here in Dallas, housing realities determine quality of life issues in our neighborhoods. But the meaning, that's another matter! Only adding to the mystery. To the here and now of things. Voice and pain and hope. Twenty-eight years ago, I discovered Jack Nelson-Pallmeyer. His powerful, analytical book, Hunger for Justice: the politics of food and faith (Orbis Books, 1980), first rocked and then began shaping my thinking about faith's practical application to the pain and injustice of real life. I'm not sure I've read a book that's had more long-term impact on me and what I do than this one volume. Not long ago, I picked up the book and thumbed through my markings. The spine is broken, the pages are falling out. "According to the biblical writers, the suffering of the poor reveals the religious and social fabric of nations. . . .
"The suffering of the poor is an indication that there is something deeply wrong in the religious and social fabric of the nation. Just as a red light flashes when a car is running without enough oil, the suffering of the poor flashes a warning that our political, economic, and religious systems are functioning without justice. When the poor were being trampled, the prophets conveyed the judgment of God: there is no knowledge of God in the land (Jer.9:6); the poor are being exploited in the marketplace and dispossessed of their land (Amos 8:4-7); and the religious and political authorities are co-conspirators against God and the poor (Micah 3:9-11; Isa. 3:14-15)." Inner city condos--join the renewal! The Central Dallas Community Development Corporation is building four really nice condos for sale here in Old East Dallas. It is amazing how this part of inner city Dallas has "turned around" in the past 10 years. Living here is a delight, especially if you are looking for diversity, interesting sights and sounds and a place close to Downtown. The condos that we have for sale are perfect homes for first-time buyers. Not only will buyers get a great value and a fine house, they will also contribute to the continuing redevelopment of this important part of the city. Check out the sign pictured here for where to call for information. We'd love to sell you one of our new homes! And, the profit goes back into future affordable housing efforts that we undertake, and we intend to do many more. This year Central Dallas Ministries (CDM) celebrates 2o years of service, community building and advocacy in the inner city neighborhoods of Dallas. It likely will be an exciting year. Turning the page on two decades--14 years of which I have observed up close and personal--has me thinking about the nature of our mission as an organization. "The mission of Central Dallas Ministries is to share the love of God in word, action and attitude while building genuine community in the neighborhoods where we live and work." Our logo attempts to communicate our strategy graphically. We believe the primary institutions necessary for community creation/renewal and sustainability are homes, schools and churches. We work on a daily basis with the people who populate these important institutions to see them grow stronger, healthier and more effective. When you look at our logo, you will see these institutions represented clearly in the forefront. We also know that neighborhood folks must connect with one another and with the "background" institutions that make a city work--business, markets, higher education, health care, government, employment. You'll see those institutions depicted in the background of the CDM logo. Our logo attempts to tell the story of our values, our focus and our daily work. But, what do we really do day-after-day? In thinking about it, here's what I believe is true about what we actually do. At CDM we EMBRACE. We stop and we try to pay attention to what people are saying about themselves, their lives, their pain, their fears and their hopes and dreams. We welcome folks and we love them where we find them and where they find us. Stopping and welcoming leads to lots of hugging and acceptance! At CDM we GATHER. We learn the value of taking seat for deeper conversations, for the nurturing of relationships and friendships. As we sit together, as we visit, we come to know what is possible and how we can get on with life in Dallas together. In our gatherings we share resources, provide training for lots of people and we receive wonderful benefits from the community around us--both the poor and the rich. At CDM we CHALLENGE. We often reach a point where we stand up, almost always with the partners we've made while visiting. We take a stand together to challenge unfair systems, to undo things that are put together in a way that benefits the few at the expense of the many. We also have learned to challenge one another to simply be better, do better and realize the higher good. Our values inform our mission. As we persist, community forms, lives change and the city grows stronger in terms of the health, well-being and hope it extends to every resident. Almost three decades ago (man, I'm gettin' old!) I discovered Bread for the World. I was a very young pastor serving a downtown church in New Orleans. I saw hunger on a daily basis, as I do today. I'm not sure how I discovered the organization. But, when I did, I realized I had found an invaluable resource for understanding and shaping public policy around the issues associated with poverty both domestic and foreign. Bread for the World is still going strong, actually stronger than ever. I recommend the organization and its work whenever I have the opportunity. If you care about people who know far too much about poverty from personal experience, you'll want to become a member of BFW. If you want up-to-date and accurate information about subjects of real concern, like the current battle over the farm bill, you need to check out BFW. If you don't know what to do about hunger, join BFW for annual offering of letters organizing materials that can help mobilize your small group, Sunday School class, church or business associates to work for improving life for the poor here at home and around the world. Check out Bread for the World at http://www.bread.org/. What follows comes to us from the Metro Dallas Homeless Alliance. If you live in or near Dallas, you might want to consider being involved in this unusual process. The "point in time" census of our homeless population is very important to the work we are doing to end chronic homelessness in Dallas by 2014. It is once again time to conduct the Metro Dallas Homeless Alliance (MDHA) annual Homeless Count & Census. The census is conducted each year in the last week of January so that Dallas and Collin County can collect information on our homeless residents. With MDHA's renewed commitment to end Chronic Homelessness by 2014 and the opening of the Homeless Assistance Center in April 2008, the Homeless Count & Census allows us to monitor our progress in achieving this goal. The Census helps us to complete a needs assessment for the community and encourage the development of programs to fill identified gaps. The information compiled during the census is also used by several interested groups, including non-profit organizations, faith-based groups, media outlets and various departments in Federal, State & local government. HOW TO HELP: Volunteers are needed for both the indoor and outdoor census. Indoor Volunteer Team Member: Conducts the homeless survey in an indoor location, such as an emergency shelter or transitional housing facility. Law enforcement professionals are not assigned to these teams, but a staff contact will be provided for teams who visit these locations and agency staff will be present. Outdoor Volunteer Team Member: Conducts the survey outdoors in teams of 3. Law enforcement personnel are also assigned to each team for safety reasons. Training on how to conduct the census will be provided for volunteers on the night of the census. Volunteers will begin signing in from 5:30 – 6:00, and should arrive no later than 5:45 P.M. in order to receive all of the information presented. Community organizing is an essential tool for the work of neighborhood revitalization. Organizing is an imperative if justice is the goal. My hat's off to Dr. Janet Morrison, her team at Turner Courts and to those members of the community who are stepping up to demand improvement and to work for a better home for themselves and their children. Central Dallas Ministries has been providing after school programming and other services in the Turner Courts housing development since 2000. The real measure of the success of any of our efforts is always going to be reflected in the quality of the nature of our relationships with our neighbors who live in the places where we also live and work. It may seem strange that an after school initiative would lead to what is described below. To me it is the most encouraing news I've heard in a while. What follows was lifted directly from Janet's blog on Saturday, Januray 5, 2008(http://janetmorrison.blogspot.com/). Put her site on your favorites list and check in on her whenever you have a moment. I think you'll be encouraged by what she reports. We are starting our new year off right in Turner Courts. This morning we had a meeting with the city. Yes, the city. We had a representative from each of the following departments: Public Works, Animal Control, Dallas Police Department, Community Prosecutor's office, DART, City Planning Commission, City Parks and Rec, City Council... along with a few others. The show from the city was quite impressive... especially to those of us who have been in Turner Courts for many years and have often dealt with ignored 3-1-1 calls to the city, neglect in repairs, and a feeling of being completely forgotten and left out. It was also quite impressive because we knew (and warned the city officials) that our first meeting was not going to be big. We had about 9 people attend...some current residents, some former, and some of us who work there but don't live there. Yet, they came anyway. The meeting was good, but the best part of the whole day for me came when the meeting was over. Ms. Haynes had come to the meeting...despite her semi-protest a few weeks ago as she explained to us that she didn't want to be involved in anything like that because it makes her blood pressure go up. She explained that she had done her part by reporting things and the city hadn't responded quickly, if at all. After it was all over, she sat down at the table. After the room had pretty much emptied out, Ms. Haynes (a resident in Turner Courts for many years) turned to Sylvia, Wyshina and me saying, "I really enjoyed that. You guys are really to be commended for bringing this together." I asked her what it was that she enjoyed about it. "I was able to get all of my issues out there." Ms. Haynes voice was heard. We have gotten to know Ms. Haynes over the past few months because she utilizes our computer lab on a regular basis. As I approached her with the thought of working with us to hold the city accountable and helping make our community stronger, Ms. Haynes balked. See...Ms. Haynes has lived in Turner Courts for a long time. During that time she has made calls to the city, made police reports, reported street lights that are out...and got a slow response at the very best. Her doubt and skepticism is understandable. Why should she spend her time spinning her wheels on issues that won't be addressed anyway? We have a LOT of work to do and a lot of issues to solve. But our biggest job is going to be earning the trust of the community so that they will begin coming out to help us move forward and hold the city accountable. Turner Courts and the people in that community have been left out for too long. Convincing people that their voice matters is going to be a long process. The smile on Ms. Haynes' face and her very genuine compliments today tell me we may have gained one more core person to our efforts. Knowing that people are being heard, are regaining trust, and are willing to try putting effort into their community again (although cautiously) puts a smile on my face. As I age, the wisdom, joy and hope of children become more essential in my life and experience. My 5-year-old granddaughter, Gracie, spent some time with me over the New Year's weekend. Hard to believe it's 2008. How do we make it through the year ahead? At one point during her visit, Gracie and I were alone--actually hiding from her mom trying to extend our time together!--and the subject of what she wished for came up. "Gracie, if you had three wishes, what would you wish," I asked her. "That's easy, granddad," she replied. Quickly, she reeled off her top three wishes for me. "First, I wish unicorns were real. "I wish birds would come to you. "And, last, I wish that whatever I wished for would come true," she told me. Maybe I find just what I need for 2008 in her short list of wishes. One part magic and mystery. Everyone has to embrace the hope and possibility of myth to survive this world, at least it seems so to me. One part harmony with the simple, but uncontrollable things of life. Something as beautiful and free as a bird really should come to you when you call, especially when you intend no harm to the natural order, but desire only to know it more completely. For Gracie all things living are intriguing and filled with sheer wonder. She just wants a closer look! Me too. One part impossibility, at least alone. No one can have every wish come true. But it is clear to me, after spending an afternoon with my granddaughter, that we'll come closer to realizing the really important dreams if we stick together. What works for families also works for communities of people. Three little wishes that bring all of life into better focus. I'm wishing for more time with Gracie, Wyatt and Owen during my New Year! Those who support the wholesale deportation of undocumented immigrants, mostly from Mexico, who have been in the United States for up to two decades, are simply wrong. These radical voices who characterize as "amnesty"moderate and sensible proposals to create policy that would acknowledge and account for the presence of these immigrants clearly do not enjoy personal relationships with any of the immigrants in question. And, when did "amnesty" become a four-letter word in our nation? I know, I know. The law and law and order. I get that. But, law is never adequate when dealing with the human reality and all of its dilemmas, especially when shaped by market forces and the human spirit. For over twenty years we have taken advantage of the cheap immigrant labor that we allowed to flow unchecked across our southern border. Now some want to legislate a policy that would ignore this contribution to our national benefit. As a friend said to me recently, "I would assume it is better to keep jobs inside our country, rather than exporting the work overseas or outside our borders." I think he is correct. Of course, the idea that we could deport millions of people is laughable. But, let's move beyond politics and public policy. What happens when people connect as friends? Or does friendship not matter any more in America? I can't tell you how much their presence meant to me and my family. They were accompanied by other members of their families. They carried bouquets of flowers to leave at the grave. They came to express their sympathy and their love. They are my dear friends. They love me and my family. We love them. To send these children back to a country they do not know would be wrong. That judgement is true from a policy standpoint. It is also true from a human and moral standpoint. Call it "amnesty" or whatever. Finding a way for these bright young people and their families to remain in the United States, continue their education and work to make the nation stronger and more productive is simply right--it is the moral high ground and it is simply common sense. Friendship changes things. People who do not know undocumented immigrants like these two young people should either make some new friendships or simply be quiet. With the Iowa caucuses today, the New Hampshire primary only days away and the rest of the Presidential campaign unfolding rapidly, you may want to review the candidates' positions on poverty and opportunity at http://www.spotlightonpoverty.org/. On this non-partisan site, you can also find exclusive commentary by national leaders, recent reports, analyses and data. Please forward this information to your network and remember to check out http://www.spotlightonpoverty.com/ for links to the latest research, data, and organizations working on poverty and opportunity. Sign up to receive more updates from Spotlight here. Spotlight on Poverty and Opportunity is an initiative of the Annie E. Casey Foundation, Eos Foundation, and other major national foundations. At noon on the first Thursday of each month, Central Dallas Ministries hosts a 75-minute encounter with some of the most important books on the issues that we care most about in our work among our inner city neighbors. We call the experience "Urban Engagement Book Club." We meet at the Highland Park United Methodist Church (Room 386) on the campus of Southern Methodist University. The Foundation: A Great American Secret: How Private Wealth is Changing the World, Joel Fleishman. The Revolution Will Not Be Funded: Beyond the Non-Profit Industrial Complex, Incite! Women of Color Against Violence. Immigrants and Boomers: Forging a New Social Contract for the Future of America, Dowell Myers. Same Kind of Different as Me, Ron Hall and Denver Moore. Giving: How Each of Us Can Change the World, Bill Clinton. Poverty and Place: Ghettos, Barrios, and the American City, Paul Jargowsky. Letters to a Young Teacher, Jonathan Kozol. Ain't No Makin' It: Aspirations and Attainment in a Low-Income Neighborhood, Jay MacLeod. Falling Behind: How Rising Inequality Harms the Middle Class, Robert Frank. Come On People: On the Path from Victims to Victors, Bill Cosby and Alvin F. Poussaint. Good to Great and the Social Sectors: A Monograph to Accompany Good to Great, Jim Collins. White Metropolis: Race, Ethnicity, and Religion in Dallas, 1841-2001, Michael Phillips. Our Day to End Poverty, Shannon Daley-Harris, Jeffrey Keenan, and Karen Speerstra. Plan now to join us for the first meeting of 2008 on Thursday, January 3 (that's tomorrow!). For more information visit our website at http://www.centraldallasministries.org/uebc/index.htm.